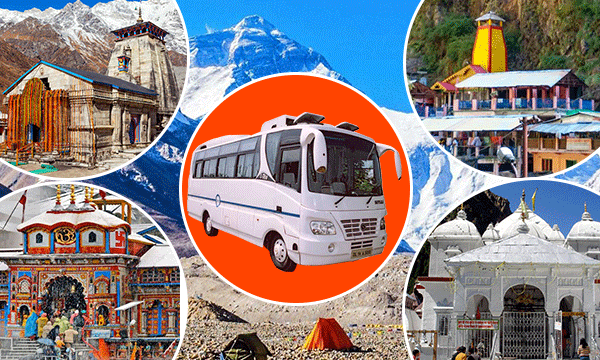 The tour Starts from Reporting Place Bharat Bhoomi Tourist Complex, Shail Vihar, Rishikesh. At 06:00 AM with tea / breakfast enroute and leads to Barkot fro Lunch Break after which the buses will ply to Phoolchatti for dinner and night halt. Day 2: Phoolchatii to Phoolchatti via Yamnotri darsh – 8 Km By Bus, 10 Km of trek. The tours start early at 06:00 AM. After having breakfast at TRH Jankichatti the trak starts for Yamnotri for Visit to Yamnotri Holy dip, pooja, darshan and lunch Break after it comes back to Phoolchatti by evening 05:00 Pm for dinner and night halt. After tea / breakfast at TRH Gangotri Tourist enjoy Holy Dip in Ganges, Darshan, Pooja and After Lunch the tour commences to Uttarkashi by 06:00 PM for dinner and night halt. The day will be hectic with a long drive of 275 KM in hills. The trip starts as 06:30 AM, after having tea / breakfast at Chinyalisaur and enroute visit to Tehri Dam site and lunch at Tehri to Give a halt at Guptkashi for Dinner and night stay. After pooja / darshan the tour comes to halt at Joshimath by noon for lunch. After lunch one can visit Auli by Cable car on Payment Basis, visit to Jyotirmath and come back to Joshiumath for Dinner and night halt.